January 16, 2019 | Thomas D. Williams, PH.D.
Father we pray that our nation will turn from its wicked ways, and bring glory to Your name while there is yet time. 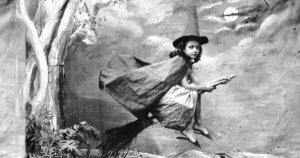 Witchcraft is proliferating in the U.S., with some 1.5 million Americans now identifying as witches, while mainstream Christian denominations shrink in numbers each year, the report claimed. In a major 2015 study, the Pew Research Center found that the United States had experienced an alarming dip in religiosity over the prior seven years, with Christianity suffering the biggest losses, especially mainline Christianity, which fell by 3.4 percent. Though the United States is still a statistically “Christian nation,” with some 70 percent of Americans identifying themselves as Christian, it is markedly less so than even a generation ago…. Over the course of three detailed religion surveys, Trinity College in Connecticut found that Wicca has grown tremendously, from an estimated 8,000 Wiccans in 1990 to some 340,000 practitioners in 2008. In a 2017 study, Pew found that religious affiliation and practice had dropped off dramatically during President Barack Obama’s two terms in the White House. “As Christianity declines across the country, paganism has swung to the mainstream, with witchcraft paraphernalia for sale on every high street and practices normalized across popular culture,” Friday’s Telegraph article declared…. Satan, the Lord rebuke you! Precious Heavenly Father, I thank and praise You for Your love for us in that while we were sinners Jesus Christ died for us on the cross. I thank You that our sins have been covered by the precious blood of Jesus our Savior. Thank You, for the gospel going forth across our nation through Christian radio, TV, and the internet. Yes; The devil was defeated at the Cross That why we must continue to Pray without ceasing with Word of spoken out of our mouth in Unity . Praying for the lost souls to be delivered and set free from hands of the enemy. As we continue to Pray there will be revival. All of these Prayers above are Mighty and I am in agreement and join you. I say that the secret plot of the enemy is being brought to light concerning abortion and the spirits behind it. Time to Pray and heed the word of God…If my people who are called by my name shall turn from their wicked ways then will they hear from Heaven and I will heal their land! I do not agree that Christianity has declined. I do KNOW that Christians who are committed to a discipleship life in Christ have been leaving organized religion in droves because they are not teaching true Christianity. But our Christian base is much stronger than your polls may show. And nothing breaks the chains more than fasting with our prayers.Yes. Christianity is very strong w/i the Army of GOD as we fast with our prayers and break the strongholds oh the enemy. We pray twice a day for our country and Pres. Trump, Vice Pres. Pence, their families and cabinet and their families. We also pray for the souls of the demonic left!!!! We must continue to pray for a mighty revival in our beloved country. Our agenda must be GOD’S agenda. Where do I find the Pew research on declining practice of Christian worship. is Pew research center on religion.